Tamarack Farms Winery is located among the tall towering pines in the beautiful Northwoods of Hayward, Wisconsin, and is surrounded by some of the most crystal-clear pristine spring fed lakes found anywhere in America. Throughout the years, Wisconsin has been the home to many award-winning breweries because of the quality of the water and the rich soils making it the perfect home for many abundant, thriving farms. The water we make our wines with comes from deep within water wells that tap some of cleanest aquifers and reach all the way into Canada, which were created back in the ice age when glaciers covered most of this area. So how did some Northern Wisconsin lakers & farmers connect with the best west coast vineyards and the best winemakers? This connection is “serendipity at its best!” …there are Famous Dave’s restaurants in California’s and Washington State’s Columbia River Valley located in some of the best winemaking areas in the country. For example there is a Famous Dave’s in Yakima, Washington and this is right in the heart of what is known as Yakima Valley Wine Country… Washington’s Real Wine Country. We had some Big Fans already! It turns out that these great winemakers are also great fans of Famous Dave’s award winning barbecue and they know there isn’t anything that goes better than some Famous Dave’s barbecued ribs than with a great glass of wine! When they found out that the BBQ Legend and BBQ Hall of Famer “Famous Dave” Anderson was opening up a winery they offered up all the help we needed both in wine making expertise and supplying us our own personally selected grape juice for our wine making. So in addition to our crazy good fruit wines, we are working with the top wine grape growers to hand select our grape varieties to make good quality, highly drinkable, and affordable red and white wines. 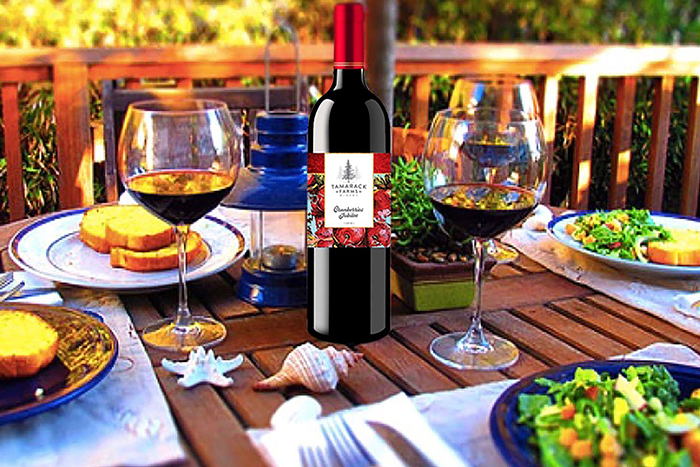 Tamarack Farms Winery also features a special library of the best small batch artisan crafted grape wines that we try our darndest to source only the highest quality wines you will never see in Big Box Wine Stores, Liquor Stores or Grocery Stores. We go to great lengths to try and find wines that are NOT mass produced wines. It is our goal to find small wineries like ours where devoted artisan winemakers passionately make very terrific tasting wines. These vineyards are too small to sell to the big box retailers but perfect for wineries like ours. We are proud to say we have The Best of Both Worlds. While we are starting out featuring the grape wines from other small wineries we are in process of setting up our own tanks. We’ve been able to team up with the best vineyards and the best wine makers allowing us to hand select our vinifera wine making grapes used in our Reds: Cabernet, Pinot Noir, Red Blends, and our Whites: Chardonnay, Sauvignon Blanc, and Riesling. Make sure and sign up for our mailing list as you’ll want to watch for these releases in the upcoming year! We proudly feature Wood-Fired Pizzas—and it’s the perfect pairing to go with our great tasting wines. Our winery features a one of kind, hand built Italian wood fired pizza oven made especially to meet the Rib King now turned “Pizza King” Dave Anderson’s exacting specifications. Most people know "Famous" Dave Anderson for his award-winning BBQ Ribs and those close to him know he's from the North-Side of Chicago; Home of Traditional Chicago-Style Thin-Crust Pizza. Tamarack Farms enlisted Dave to use that same passion to create Pizza Nirvana in Hayward. 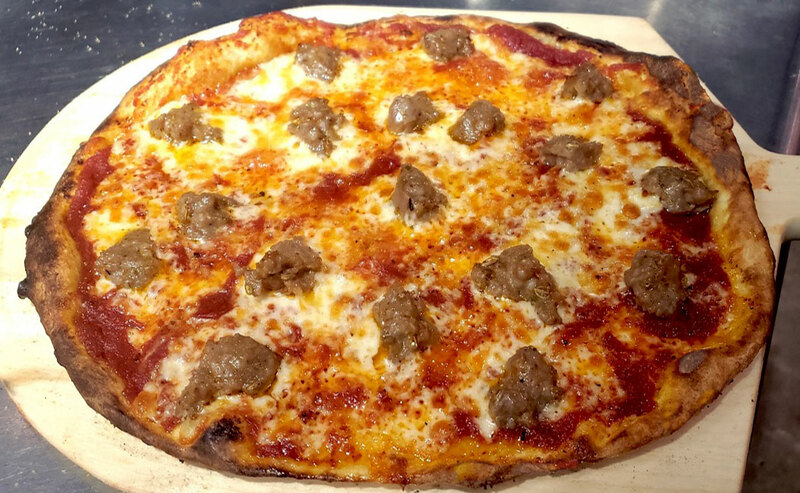 Our pizza features a custom Wisconsin cheese pizza blend, sausage tailor-made for Tamarack by 3rd generation sausage makers in Chicago, and sauce made from sweet California tomatoes that is packed within 6 hours of being picked giving our pizza incredible flavor. *Winery opens at 2:00, Kitchen opens at 4:00.